On a recent trip to Heerbrugg, Switzerland, Jim Fleming, a contributor to Professional Surveyor Magazine, had the privilege of visiting Leica Geosystems’ headquarters. With an opportunity to get a rare glimpse into the Swiss company’s inner workings, Fleming returned home impressed with the company’s methodology in designing and producing its equipment. Beyond that, he was impressed with the history and how the company’s roots continue to affect today’s world for the professional surveyor. That same attention to detail extends to the quality-control process. “Rather than test random instruments pulled off the assembly line for conformance with specification—such as the temperature range the instrument is expected to work properly within—every instrument is tested to confirm it meets all the published performance specifications,” Fleming notes. Even though the visit to the facility highlighted the company’s attention to detail and their business practices, Fleming says that was only part of what left a lasting impression on him. The company history truly fascinated him, leaving him reflecting on its historical connections to the modern surveyor. In particular, what caught his attention was Leica Geosystems’ connection to the legacy of Swiss surveyor and inventor Heinrich Wild, the man who set the foundation for the Leica Geosystems of today. Born in Mitlödi Switzerland on November 15, 1877, Wild entered the industry as a teenager and, at the age of 43, founded Heinrich Wild, Werkstätte für Feinmechanik und Optik. 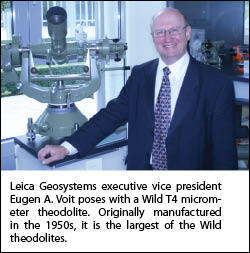 The company’s name changed in 1954 to the now more well known Wild Heerbrugg AG, the company that eventually became Leica Geosystems after the 1990 merger of Wild Leitz Holding AG with the Cambridge Instrument Company Plc. The merger originally created the new Leica Holding B.V. group, which paved the way for the company as it is structured today. It is now a wholly owned division of the Swedish corporation Hexagon. Wild had bad experiences working on high-mountain triangulation with the conventionally designed theodolite, and in 1905 he reworked the design. For the high-altitude work, he created a new theodolite with rotable circle and coincidence circle-readings. Two years later he moved to Jena, Germany to join the lens company Carl Zeiss and build a new department producing geodetic instruments. He started with leveling instruments and then created yet another new version of the theodolite. Wild became aware of the company during a stretch when he was working with the military, and his tenure with Carl Zeiss was an influential one. “While working on the military rangefinders, Wild became familiar with the German lens manufacturing firm Carl Zeiss, and in 1909 he approached them looking for a manufacturer to produce his inventions,” explains Fleming. “Zeiss created a new division, Geo Carl Zeiss, devoted to the development and production of geodetic instruments with Wild at the helm. Over the years, Wild’s contributions included the Wild T2, Wild T3, and the stereo autograph Wild A1, a tool for aerial photo in-terpretation. These tools, products of Wild’s Swiss facility, have had a broad-reaching impact on the surveying industry that is still felt today.